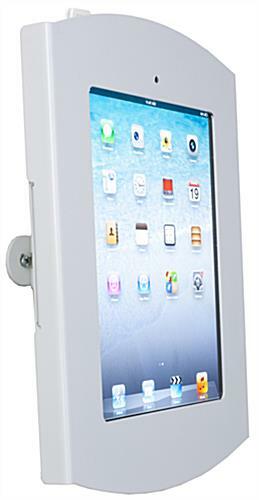 This Wall Mount IPad is Designed for Retail Stores! Tablet Bracket Solutions are Reasonably Priced on This Site! 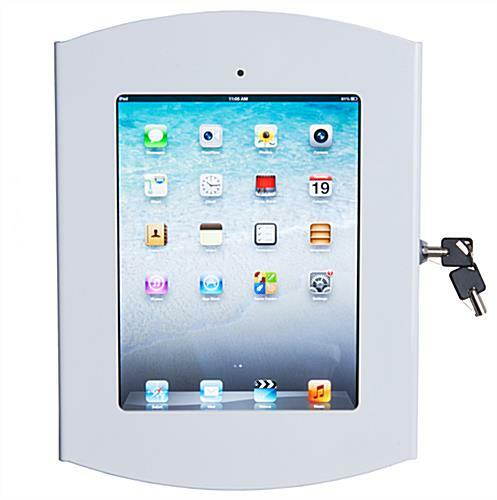 Place an Order Today for a Wall Mount IPad! Steel construction with a white finish is durable for years of use. Built-in locking mechanism protects iPad from theft. 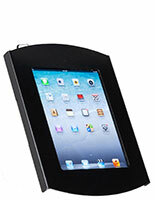 Enclosure is made for the Apple® 2nd, 3rd, or 4th generation & Air tablet for versatility. Foam pads are included to protect the iPads from scratches. 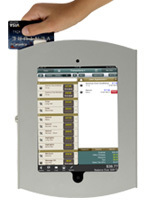 This wall mount iPad is made to display an Apple® generation 2, 3, or 4 tablet in a retail environment. These touchscreen bracket systems can be placed at eye-level for the average consumer so they can't be missed. This wall mount iPad is often preferred over the floorstanding and countertop units because these do not take up space that can otherwise be used for more products or walking space. These touchscreen holders have many great features. 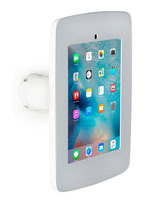 Each white wall mount iPad, tablet dock conceals the home button. Some other styles of the Apple® enclosures leave the home button exposed, but that often leads to unwanted tampering by patrons. 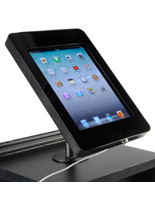 This tablet dock is a wall mount iPad that easily rotates from portrait to landscape orientation. Users do not have to remove the case and flip it, like some of the other bracket systems. 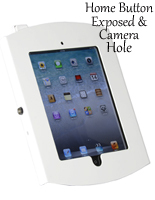 Each wall mount iPad, called a tablet holder, comes equipped with a built-in lock. Customers love the built-in lock because they can feel better knowing the touchscreen device is secure and its one less thing they have to worry about purchasing later. 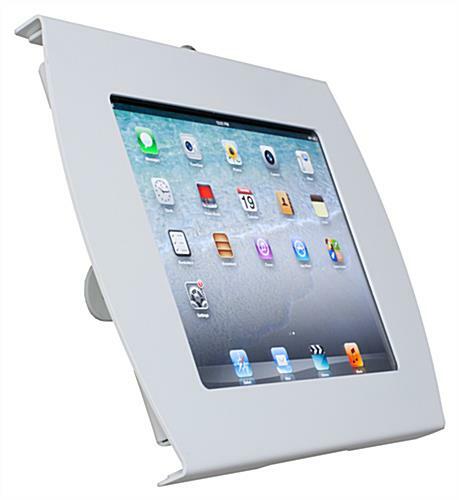 This wall mount iPad also tilts to give users the best viewing angle possible. The tilting range is limited due to the wall, but it will still offer consumers sufficient viewing options. 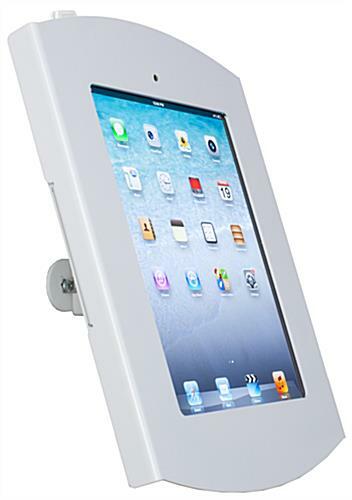 A wall mount iPad that has foam pads will keep the tablet safe from scratches. These brackets with the foam pieces also ensure the Apple® devices are securely held in place. Each dock is a wall mount iPad that is made durable. The steel construction of this bracket is heavy duty to last a long time, but the price is still low to work with any sized budget. 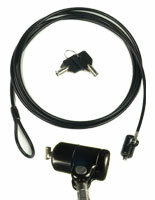 Tablet dock systems on this site come with all the necessary hardware for mounting. Placing tablets in a prominent location in a department store will draw in the attention of potential customers and get them excited to learn about your products and services.